The Lair of the White Worm is a horror novel by the Irish writer Bram Stoker. It was first published by Rider and Son of London in 1911 – the year before Stoker's death – with colour illustrations by Pamela Colman Smith. The story is based on the legend of the Lambton Worm. It has also been issued as The Garden of Evil. In 1925 a highly abridged and rewritten form was published. It was shortened by more than 100 pages, the rewritten book having only 28 chapters instead of the original 40. The final eleven chapters were cut down to only five, leading some critics to complain that the ending was abrupt and inconsistent. 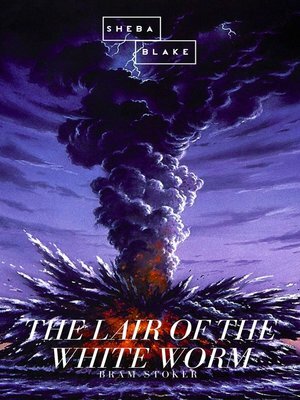 The Lair of the White Worm was very loosely adapted by Ken Russell as a 1988 film of the same name. The first episode of the German radio drama "Die Schwarze Sonne", produced by the label LAUSCH, is loosely based on the events of The Lair of the White Worm. The main characters of the radio drama are also based on the protagonists of the novel and feature in the rest of the episodes even though the plot turns away from Stoker's original story. The plot focuses on Adam Salton, originally from Australia, who is contacted by his great-uncle, Richard Salton, in 1860 Derbyshire for the purpose of establishing a relationship between these last two members of the family. His great-uncle wants to make Adam his heir. Adam travels to Richard Salton's house in Mercia, Lesser Hill, and quickly finds himself at the centre of mysterious and inexplicable occurrences. The new heir to the Caswall estate (known as Castra Regis or the Royal Camp), Edgar Caswall, appears to be making some sort of a mesmeric assault on a local girl, Lilla Watford, while a local lady, Arabella March, seems to be running a game of her own, perhaps angling to become Mrs. Caswall. Edgar Caswall is a slightly pathological eccentric who has Mesmer's chest which he keeps at the Castra Regis Tower.